The Dining room is cut from lazerboard. It can be painted, or sealed for a wood look as shown in the photo here. Very sturdy and easy to assemble! Dining room includes, table and chairs, side buffet, framed artwork and wallpaper with faux draperies. Please be aware that there is some variance in the room sizes of the baby houses. 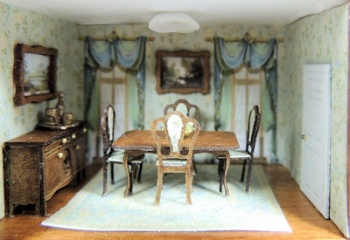 We have tried to scale the wallpaper so that it will work in all of the houses, but some variance as to exact window placement on back wall may occur.